Ever since I picked out a modern interpretation of an Apicius pork dish in Dom’s first ever Random Recipe challenge (and that was quite a while ago now) I’ve been playing around with some of the other recipes (I use the term loosely) in this text from ancient Rome. Since my Latin is a little rusty, I’ve lazily resorted to translations I’m afraid. There are actually ten “books” in the Apicius writings that (sort of) add up to a complete treatise on cooking. The books are named in honour of Apicius, who was known for his love of fine food, but were actually compiled long after his death. And I think that’s more than enough facts for now. You need a fair amount of imagination with some of the “recipes” in Apicius: there are few exact quantities given or methods described and some of the ingredients, such as the plant silphium or laser, no longer exist. So I feel justified in bringing you a fairly free adaptation of an Apicius sauce for duck (or, as Apicius suggests, crane). The sauce might sound odd, but I promise you that it works. If you can’t lay your hands on any lovage, you could use a little finely chopped celery instead. This is not an Apicius method of cooking duck. In fact, it’s the way I saw Paul Rankin cook duck breast on the TV around 1994 and I’ve used it ever since. This will serve 2. Stir in the olive oil and pour the mixture into a small dry pan. Heat until the mixture just begins to fry and then pour in the wine. Stir and allow the wine to reduce by about a half. Lower the heat and stir in the honey and mustard. Either keep the sauce warm or chill and reheat later. Preheat the oven to 220°C. Trim any excess skin or sinewy bits off the duck breasts. Score the skin with a very sharp knife and season them all over with salt and pepper. Place the duck breasts skin side down in a dry frying pan: this needs to be one that can be placed in the oven. Place the pan on a moderate heat and cook the breasts for about 5 minutes until the skin is looking crisp. Pour off all but a little of the fat released by the duck and turn the duck breasts over. Cook on the flesh side for 1 minute until lightly coloured. Turn them back onto their skin side and place the pan into the oven. Let the duck breasts roast for 4 minutes (or 6 minutes if you like your duck less pink and 8 if you like it not really pink at all). Remove the duck breasts from the pan and let them rest for a few minutes, skin side up. Serve the duck breast sliced or whole on a puddle of the reheated Apicius sauce. Simply cooked fresh veg is as good as anything else alongside it. Karen over at Lavender and Lovage has suggested that I link this recipe up to the May Herbs on Saturday Blog Challenge and that seems like a fine suggestion to me. Thanks, Karen. 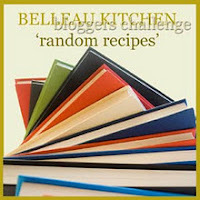 For this month’s Random Recipe challenge Dom of Belleau Kitchen is celebrating two years of blogging and has asked us to bake him something lovely but random. For some reason I don’t have any cookbooks purely on baking (well, I probably do but I couldn’t find any). So instead I thought I’d randomly select from a folder of recipes that I’ve taken from magazines over many years – there’s plenty of baking in there. When I opened this, though, I came up with something that might not be an obvious choice, but which I just couldn’t resist baking – Michael Barry’s Crafty Chocolate Cake. Way back in the early eighties Michael Bukht/Barry lived very near me in London and I got involved in the campaign to get him elected during a brief and probably ill-advised sortie into politics. Did he get elected? No, not even close. But this cake reminds me of strange and oddly enjoyable days knocking on doors, folding leaflets, hanging around polling stations and trying to get over the defeat by spending what seemed like several days in a pub. (Mr. Bukht wasn’t there – he was probably off somewhere starting up another radio station). So sorry, Dom, this bends the Random Recipe rules a bit and has even turned elegiac rather than celebratory but the important thing is that this is a remarkably easy (sorry, I should say crafty) and very pleasing cake. In the eighties I’d probably have filled it with cream but in these more restrained times I decided on apricot jam instead. Despite being so well known once, this recipe is getting a little hard to find but there’s a version of it available on this Oxfam site. The site promotes the use of Fair Trade products and, yes, I did use Fair Trade products when making this cake. One word of warning, though: I’ve made versions of this cake in several different ovens over the years and it’s never taken as long as the recipe suggests, so be careful not to overcook it. Thank you Mr Bukht for some interesting memories and canapés. 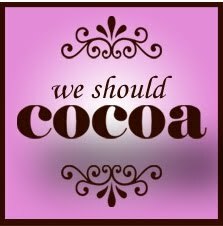 For this month’s We Should Cocoa challenge Choclette of Chocolate Log Bog has asked us to combine cheese and chocolate. Well, I just couldn't resist using Choccy Philly (or Philadelphia with Cadbury as we seem to be urged to call it – at least in this country). This is a great product for knocking out desserts such as chocolate mousse in a couple of minutes and claiming that you’ve spent hours in the kitchen. Although I’ve not tried it yet, I have it on very good authority that you can also use it to make a remarkably easy ice cream. Anyway that’s enough unpaid and unsolicited advertising for cheese and chocolate companies. I’m actually being a bit of a fraud here, because this dessert was dreamed up and largely put together by my wife. I don’t think there’ll be any copyright disputes, though. This is, for once, a reasonably healthy little treat. The recipe will make 2 individual tarts. First, make the filo cases. You can use any suitable mould but non-stick metal tins of around 10 cm diameter are ideal. (I’ve sometimes seen these sold as individual Yorkshire pudding tins). You need enough filo pastry to generously line each tin four times. Using 10 cm diameter tins, this will probably mean that one sheet of filo cut into 4 pieces will be enough for each tart. The sheets do vary in size, though, so don’t blame me if that’s slightly out. As usual with filo, once you’ve cut 4 squares for each tin, keep them covered to ensure they don’t dry out. Preheat the oven to 160°C. Very lightly brush the insides of the tins with butter. Brush a square of filo very lightly with butter and gently persuade it into the tin. Repeat with the next square, changing the angle you place it in the tin so that you get a rustic, irregular edge to the tart. Any corners that stick up too much can be tucked in to prevent them burning. Once you have four squares in each tin, crumple a piece of aluminium foil and place in each tart – it should pretty much fill the tart case. Bake the tart cases for 10 – 12 minutes or until golden. Remove the foil, allow to cool briefly then carefully lift the filo cases out of the tins. Gently dab off any excess butter with some kitchen paper and allow the cases to cool completely. Now poach the pears. Peel the pears, cut them into quarters, remove the cores and rub with plenty of lemon juice to stop them going brown. Poach the pears in the sugar syrup, which should be just simmering, until they’re soft but not falling apart. Take the pan off the heat and allow the pears to cool in the poaching liquid. Once the tart cases and the pears are cool, you can put the lot together. Place the chocolate Philadelphia in a bowl and beat it briefly to loosen the texture. Whisk the egg white to the soft peak stage, then add the icing sugar while continuing to whisk to the firm peak stage. Stir a spoonful or two of the whisked egg white into the chocolate Philadelphia to loosen it a little more, then fold in half of the remaining egg white. This will probably be enough egg white to give you a soft, mousse-like texture, but if it still seems a little stiff, then fold in some more. Divide the chocolate mixture between the tart cases. Cut each pear quarter part of the way through lengthwise, fan the pears out and arrange on top of the tarts. (You may not need all of the pears). Gently heat a little apricot jam until runny and brush over the pears to glaze. I intended this to be short and sweet post about little, spongy biscuits. But I warn you that there’ll be a bit of a Proustian moment coming up. It all started because I needed cheering up. I also didn’t have a lot of time and I had some odds and ends to use up (notably some ground nuts). So biscuits seemed to be the answer, especially since I’ve had this recipe for Biarritz biscuits lying around for a while. Happily these biscuits are quick to put together (especially if you use a stand mixer) and quick to cook. This isn’t really the classic Biarritz biscuit – for instance, hazelnuts are not normally used as far as I know - but it is a pleasing substitute. Normally Biarritz biscuits are coated in chocolate and sprinkled with coconut. I did coat some of mine with dark chocolate but, for the most part, I like them just as they are. For some reason I’ve never really cared for the coconut sprinkle. Since I needed a quick boost, I decided to have a few of the biscuits with some ice cream. And that led to the Proustian moment. I was instantly reminded of the time I was in a band back in the 1970s. We rehearsed at the flat of our lead guitarist who for some reason was convinced that his girlfriend was having an affair with the ice cream van man. We all told him he was imagining it and getting paranoid. But every day, when he heard the chimes of the ice cream van, he ran out of the flat determined to confront him. Sadly our guitarist was just a little guy and the ice cream man was built like a brick ice house. So every time he’d lose his nerve and come back with an armful of ice creams instead. We ate all that ice cream with any biscuit or wafer that came to hand. Eventually, he spent every last penny he had on ice cream and his girlfriend left him anyway. Oddly enough she went off with the ice cream van man. I think that proves once and for all that being paranoid doesn’t necessarily mean you’re wrong. The whole experience of eating these biscuits with ice cream was so nostalgic that I almost felt like getting the band back together. Until I remembered that we were rubbish. Depending on how carefully you control your spoonfuls, this will make around 50 or 60 biscuits. Beat the butter until it’s very soft and light in colour. Beat in the nuts and sugar until well mixed. Beat in the vanilla and the egg whites (no need to whisk them first). When the mixture is smooth and even, gently beat in the flour (Don’t overdo this last stage). Put teaspoonfuls of the mixture onto baking trays lined with silicone sheets or non-stick paper. Try to get the spoonfuls pretty much the same size to ensure a single cooking time. Bake in the oven for between 5 and 7 minutes (the time taken will depend on the size of the spoonfuls). The biscuits should be turning a light golden colour around the edge but should still be pale in the centre. Once cool, you can coat with chocolate and coconut sprinkles, if you wish. Store in an airtight tin. This month it's the letter 'B' in the Alphabakes challenge hosted by Ros from The More Than Occasional Baker (the host for this challenge) and Caroline from Caroline Makes. I wasn't going to enter these biscuits because I didn't think they were properly 'B' for Biarritz, more 'S' for Sort Of, but I'm pleased to say that I've been talked into it. (I'm just so easily persuaded).